The major factor of the Group’s activity for the month of September was the ferrying of gasoline to three airfields in France. This was in close cooperation with the ground forces who, in their big push through were in urgent need of the valuable fuel. 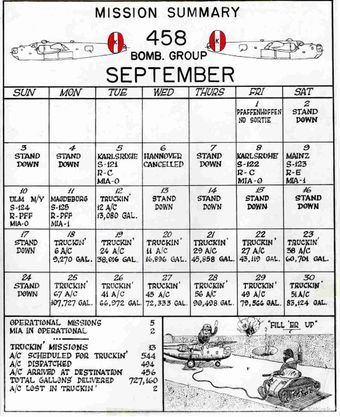 However, during the early part of the month before becoming unoperational [sic] we managed to garner credit for five sorties. We will spend more time on “Truckin” missions after we record the operational sorties. It was not until 5 September that we were airborne again. On that date we dispatched 22 A/C under the leadership of Lt Col O’NEILL and Capt GORRELL, to attack the M/Y at KARLSRUHE, GERMANY. Twenty of our A/C were over the target dropping 180x500 GP’s with good results. Sortie 121 chalked up. Poor weather kept us grounded until the 8th when once again we paid a visit to the M/Y at KARLSRUHE. On this attack we put twenty-two A/C over the target under the leadership of Capt BOOTH, dropping 57x1000 GP’s on the target with the following results: bombs of First Squadron landed on MPI and to the south. 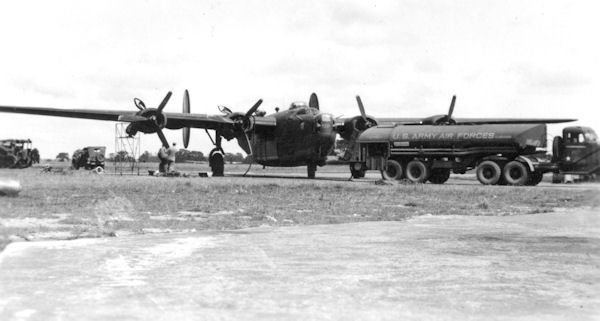 Bombs of Second Squadron landed on MPI and to north. We don’t think it will be necessary to pay another visit to KARLSRUHE. Sortie 122 was chalked up on the black side of the ledger. Again on the10th another blow at Schickelgruber’s transportation lines, this time the ULM M/Y. The way we had been hitting these M/Y would seem to indicate that after this fracas is over that the Hun will [be] forced to use bicycles or shoe leather and here’s to hoping it will be Ersatz goods at that. To go on with the serious side of the day, we placed 19 A/C over the target under the leadership of Capt SPEER and dropped 90x500 GP’s and 100x500 M17 incendiaries with the aid of PFF equipment with unobserved results. And thus ended our combat status for the month of September. 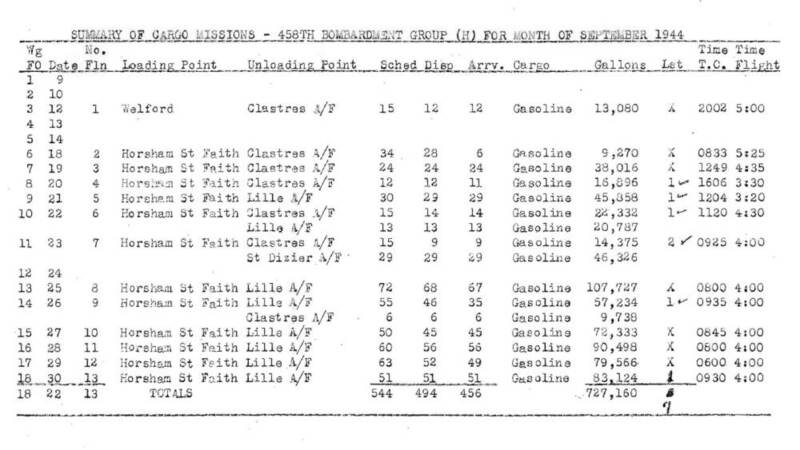 From the 12th until the end of the month we were to fulfill a mission so vital to the success of the ground forces, namely: the ferrying of 80 octane gas to three A/F’s in France. The importance, the additional work involved, the danger of the assignment cannot be over emphasized. In addition to dispatching our own A/C we had to take care of A/C from the 389th Group. Our personnel flew these A/C and our ground echelon were responsible for the maintenance of these additional A/C. We will try to give a picture of “Truckin” operations as best we can. In the beginning all A/C used in “Truckin” were equipped with 4 bomb bay platforms, and each A/C loaded with 218 five gallon cans. 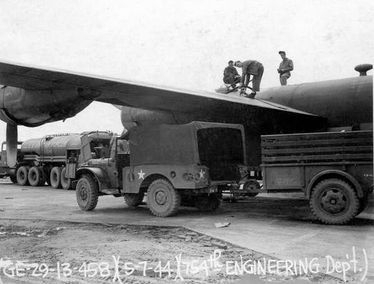 Each A/C commander was responsible for loading and lashing of gas loads in his A/C. It was figured to a fine point, that loading and unloading would take approximately four hours. On the 18 September, the bomb bay platforms were discarded in place of bomb bay and fighter [drop] tanks. Wing Tip Tanks 450 Gals. Left Front Bomb Bay 390 Gals. Right Front Bomb Bay 390 Gals. 4x108 Gal in tanks in rear bomb bay 432 Gals. 4x108 in Rear Bomb Bay 432 Gals. Front Right Bomb Bay 108 Gals. 2x165 Gal in tanks in waist section 330 Gals. All day long British tank trucks were pulling into the station, unloading and returning to their terminal for reloading. It was an endless stream of black gold and great credit must be given [to] the engineering sections for their part they played in this important task. On 11 September Col Isbell and Lt. Col Packer inspected Clastres A/F, St. Dizier and Florennes A/F. The irony of this whole project was that the group had bombed and done a remarkable job on these A/F’s when in German hands. This naturally resulted in bomb craters on dispersal areas, plus fox holes and other objects too numerous to mention that made the pilots be on their toes every time they landed or took off. Part of our personnel were ferried over to take charge of operations, maintenance crews and cooks and other sundry personnel. A courier A/C was dispatched from this drome each day in order to transport personnel and reports and act as liaison between this drome and Lille A/F. Living conditions were not in the style of AAF 123, the personnel from the highest to the lowest living in these tents, eating out of mess kits, but being rewarded for these inconveniences by a visit to the town of Lille and their subsequent experiences. 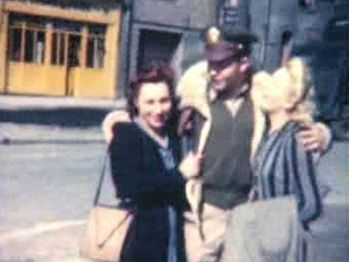 We seemed to be the only “Yank” personnel there as the A/F was in the hands of the British “Tommies” and from all reports of the men lucky enough to have been over there, the “Yanks” were well received by the grateful French. Many were the tall stories told, bottles of Champaign drunk, gifts and souvenirs picked up, and oh those French girls, whew!!!! Well, to get on with the serious side of “Truckin”. The normal crew on each A/C consisted of the pilot, co-pilot, pilotage navigator, engineer and radio operator. [many crews carried at least one gunner as well]. All members carried their bedding, rations and a canteen of water, plus the old faithful .45 caliber, just in case. The take-off weight of each A/C was 63,000 and the landing weight, 60,060. 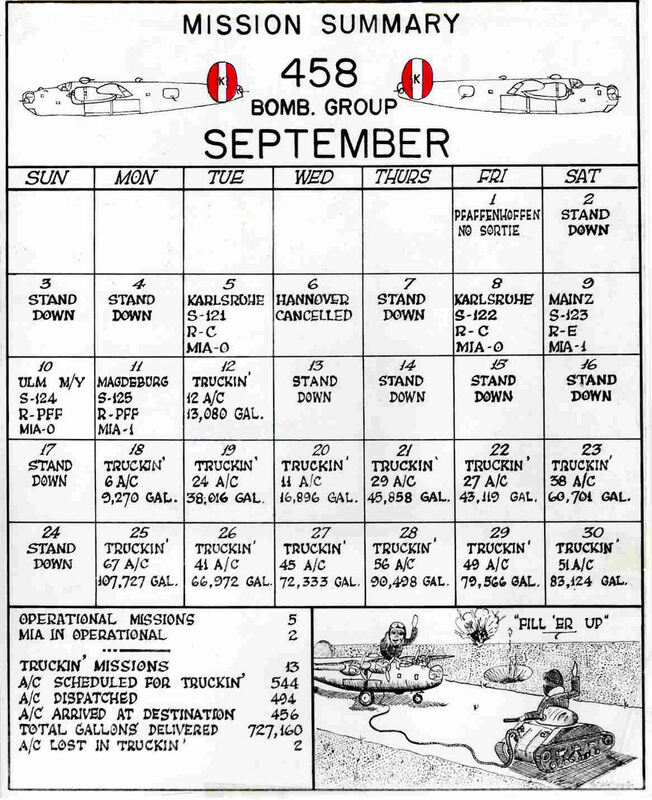 In thirteen missions we dispatched 494 A/C, and 456 arrived at the terminals transporting 727,160 gallons of gasoline. Seven missions were to Clastres A/F, eight to Lille and one to St. Dizier. On some days, A/C would be dispatched to one A/F whilst another section [would fly] to one of the other terminals. 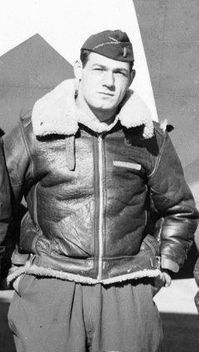 Out of 494 A/C dispatched we lost 6, one A/C [Lt Herbert H. Humke] crashed on take-off and killing all personnel on board (see KIA section for names), one A/C [Lt George J. Koehn] took off from St. Dizier and has never been heard of (see MIA Section), whilst 4 A/C (without loss of personnel) were damaged and placed in the category of salvage, when they ran into bomb craters on the French terminals. We are attaching a complete report on all “Truckin” operations, which will give a clear and concise story of the efforts of the group in this important task. The group can well be proud of their part played in the support of the ground personnel.